Often found in the produce aisle of grocery stores, Oyster Mushrooms are a popular culinary mushroom. In Japan, Oyster Mushroom is known as Hiratake and is revered as a potent medicinal mushroom. 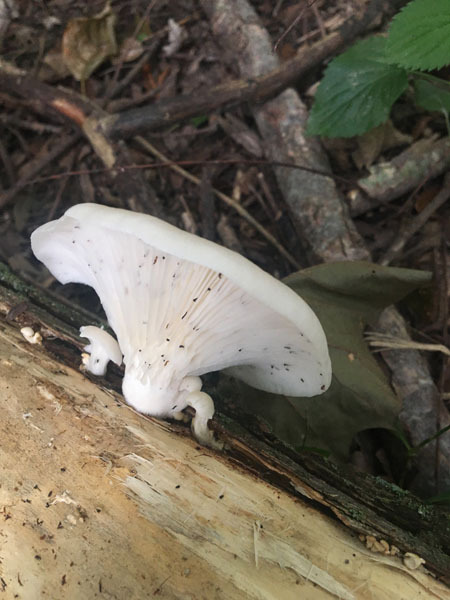 Oyster Mushroom is a saprophytic mushroom, meaning he likes to grow on dead wood, helping to break down the fibers of fallen trees. Let’s try an experiment with Oyster Mushroom. You will need a small piece of mushroom. Chew it between your four front teeth and notice any flavors that come out. How does it taste, is it mild? Sweet? How does your mouth feel, does it seem to be warming up or cooling off? Drying or moistening? Most people describe Oyster Mushroom as sweet, moistening and neutral to warming. The entire mushroom, which we refer to as the fruiting body, is used medicinally. Oyster Mushroom contains many constituents including the statin lovastatin, mevinolin, sterols including D2 and D4, ergosterol, carotenoids, fatty acids, polyhydroxysteroids, tricholomic acid, formic, malic and acetic acids, guanide, trihydroxy-ketones, tetrahydroxy-ketones, tetraol, epidioxide, cerevisterol, and triol. Nutritionally, Oyster Mushroom contains protein, fat, carbohydrates and fiber, vitamins A, B1 (thiamine), B2 (riboflavin), B3 (niacin), B5 (pantothenic acid), B6 (pyrodoxine), B7 (biotin), C, P, ergosterol (provitamin D), betaine and choline and the minerals calcium, copper, iron, magnesium, manganese, phosphorus, potassium, selenium, sodium and zinc. 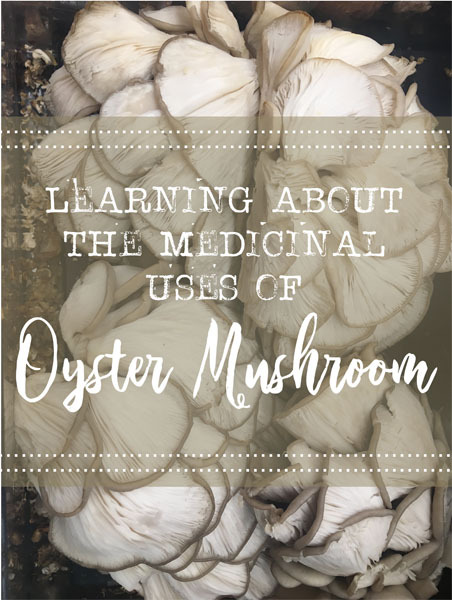 Medicinally, Oyster Mushroom is antiaging, antibacterial, anti-inflammatory, antilipidemic, antimicrobial, antimutagenic, antinematodal, antineoplastic, antioxidant, antitumor, antiviral, hepatoprotective, hypoglycemic, hypocholesterolemic, hypotensive, immunomodulator, nervine, and relaxant. In Chinese medicine, Oyster Mushroom is used to relax tendons and is used to help with low back pain, numb limbs and to strengthen blood vessels. Much research has been done on many mushrooms, including Oyster Mushroom, for their use in inhibiting cancer cells and tumors. Oyster Mushroom has been proven to be antineoplastic, antimutagenic and antitumor. Oyster Mushroom seems to be especially helpful for leukemia, lung tumors, colon cancer and prostate cancer, with studies showing promise of Oyster Mushroom’s ability to help with hormone-sensitive cancers. Oyster Mushrooms are also antioxidant, which helps to reduce oxidative damage that can lead to cancer. 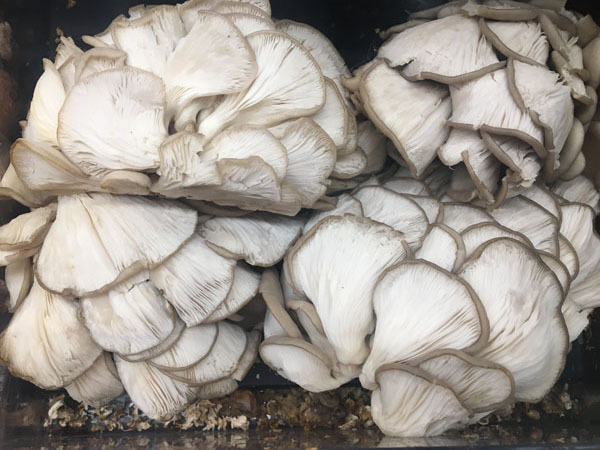 As an antimicrobial herb, Oyster Mushroom has the ability to inhibit many bacteria including Salmonella, Klebsiella pneumoniae, Eschrichia coli, Streptococcus, Enterococcus, Staphylococcus aureus, S. epidermidis, Bacillus megaterium, Candida albicans, and C. glabrata. Antiviral activity includes inhibiting the herpes simplex virus type-1 and type-2 and the hepatitis C virus. Oyster Mushroom is great for helping to lower cholesterol as he contains the statin lovastatin, a compound that is used to create the pharmaceutical medication by the same name. Robert Rogers states that the lovastatin compounds are “higher in caps than stems and more concentrated on mature gills” so if you want to consume Oyster Mushroom for lowering cholesterol, it’s best to focus on eating the caps only to get more lovastatin in your diet. While statin medications are contraindicated for many health issues such as liver disease and alcoholism, as well as pregnancy, Oyster Mushrooms are not. Livostatin also seems to prevent and reduce the inflammation that is caused by pancreatitis and stops the progression of the excessive formation of fibrous connective tissue which often happens with inflammatory bowel disease and liver disease. 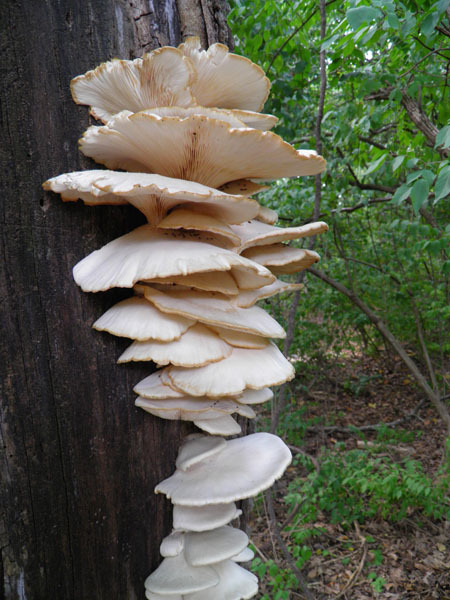 Another compound in Oyster Mushroom, the metabolite mevinolin, is also a fat lowering compound. Oyster Mushroom also helps with high blood pressure and regular consumption may be helpful for lowering your blood pressure. At the same time, Oyster Mushroom helps to strengthen blood vessels while decreasing cholesterol which helps to widen blood vessels, ensuring easier blood flow which leads to lower blood pressure. Diabetics may find Oyster Mushroom to be helpful for lowering blood glucose as a hypoglycemic due to his compound guanide. Consuming Oyster Mushrooms on a regular basis may have a beneficial effect on the blood glucose levels but if you try this, be sure to closely monitor your blood glucose levels while doing so. Oyster Mushroom supports the liver and as we talked about earlier, contains lovastatin which helps to stop the progression of fibrous tissue, which can happen in the liver for those with chronic liver issues such as cirrhosis. As a hepatoprotective, Oyster Mushroom protects the liver and reduces inflammation. As with many medicinal mushrooms, Oyster Mushroom is also an immune stimulant and immunomodulator, helping to balance our immune system when it’s under or over active and boost our immune system when we are feeling run down. Oyster Mushroom is an excellent addition to our daily diet, especially in the wintertime when our immune systems are often sluggish. Oyster Mushroom is also antinematodal – in fact, he is considered to be a carnivorous mushroom as he likes to eat nematodes. Oyster Mushrooms contain tricholomic acid which paralyzes nematodes that eat on Oyster Mushrooms. Oyster Mushroom also contains several other nematocidal compounds. Oyster Mushroom hyphae then completely cover the nematodes and absorb the nutrients which provide nitrogen to allow fruiting to take place. Oyster Mushroom contains a good amount of iron and is considered to be a blood builder. Adding Oyster Mushroom to your food can be helpful for those with anemia. 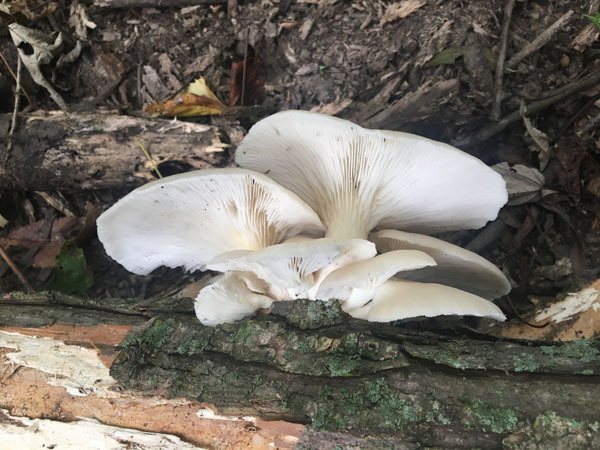 Oyster Mushroom can be found growing in the wild with his main season being the fall though he can often be found from September – February depending on the climate. Here in zone 6B (near St. Louis, MO), I find them from late August – March, generally with a break from December – January. Do you harvest Oyster Mushrooms from the wild or cultivate them? I’d love to hear your experiences about either! Share them in the comments below. This entry was written on November 13th, 2018 by KristineBrown and filed under Uncategorized.